HERCULES & LOVE AFFAIR RELEASE MUCH-ANTICIPATED NEW ALBUM OMNION – OUT TODAY! HERCULES & LOVE AFFAIR RELEASE MUCH-ANTICIPATED NEW ALBUMOMNION – OUT TODAY! The recipients of widespread critical acclaim, including two playlisted singles at BBC 6music, DJ Mag’s Album of the Month, and the coveted “Album Of The Month” slot at Rough Trade, Hercules & Love Affair release their fourth studio album Omnion today – out via Big Beat Records (LISTEN HERE). 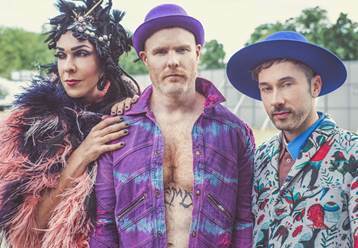 Renowned for their exuberant stage show and Andy Butler‘s knack for elegant and timely productions, Hercules & Love Affairhave – unconsciously – hit the zeitgeist with their latest album – eleven songs sparkling with faith and tolerance in response to our troubling times. Singles to date – “Controller” feat. The Horrors’ Faris Badwan, title track “Omnion” feat. Sharon Van Etten, and the latest “Rejoice” with HALA regular Rouge Mary on vocals – show that whilst it is rooted in Butler’s recovery from drug addiction, Omnion is an album of both reflective moments and joyful celebration. In addition to Badwan and Van Etten, Butler is joined on Omnion by Lebanese rockers Mashrou’ Leila and Icelandic sister act Sísý Ey, as well as regular collaborators Rouge Mary and Gustaph. From the retro-futurist Paradise Garage grooves of Hercules & Love Affair’s eponymous 2008 debut – with longtime friend ANOHNI on the classic, “Blind” – via the thoughtful elegiac songwriting of 2011’s Blue Songs, to the bumping, grittier pulse of 2014’s The Feast of the Broken Heart, Butlerhas nailed a body of work that bridges the dance floor and home listening. Following festival appearances this summer, Hercules & Love Affair bring their visually spectacular stage show – “A Feast for the Eyes” Creative Review – to venues across Europe this fall. Tickets are available now HERE.